LAHORE: (Monday, March 12, 2018): Former foreign minister Khurshid Mehmud Kasuri has said that India cannot isolate Pakistan but Pakistan’s intrinsic situation is isolating it from the comity of nations. We need to strengthen Pakistan intrinsically so that we can counter India logically and rationally. He was addressing the launching ceremony of one year post graduate diploma in Indian studies at Centre for South Asian Studies here on Monday. Former High Commissioner to India Shahid Malik, Chairman Sahara for Life Trust Abrar-ul-Haq, Dean Faculty of Arts and Humanities Prof Dr Iqbal Chawla, Director Centre for South Asian Studies Prof Dr Umbreen Javed, faculty members and a lot of students were present on the occasion. Addressing the ceremony, Mr Kasuri said that the resolution of bilateral enduring issues between India and Pakistan could not be war, the only solution of their issues was the resumption of dialogue process between the both. He said that China too is not in favor of confrontation between the two but she wanted them to sit on the negotiation table. Mr. Shahid Malik said that a number of institutions are working in India conclusively on Pakistan. He said that a huge number of books had been published on Pakistan in India that shaped the cognizance of researchers. He said that launching an Indian Desk was also a timely initiation that would help researchers, students and policymakers etc to comprehend India’s mind. Furthermore, he said, the only solution of Kashmir issue is dialogue between India and Pakistan a with third-party mediation. 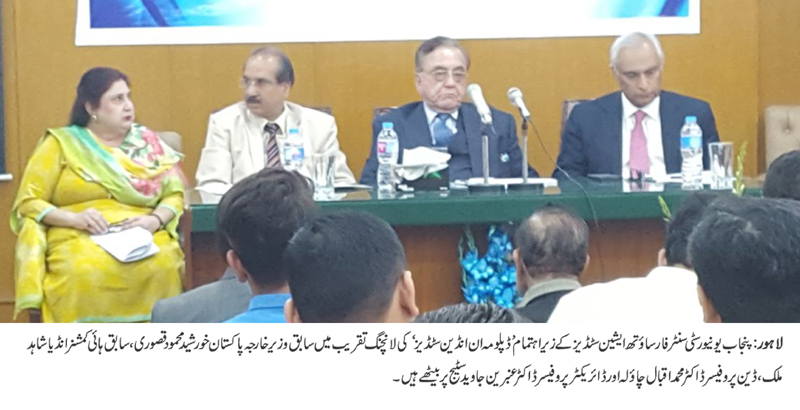 Prof. Dr. Iqbal Chawala appreciated the untiring efforts of Prof. Dr. Umbreen Javaid for commencing the diploma, holding lectures, conferences and publishing books infrequently. He said that all these efforts would help the experts and intellectuals to understand India’s intensions incited by various organizations working in India as the RSS and Hindutva. Mr. Abrar-ul-Haq said that if there was any terrorist activity executed in India, she named Pakistan and ISI’s hand in it. He said that however it is repeatedly proved that India had her own hands in carrying out the terrorist attacks. He said that on the other hand, it has been proved that India had her hands in subverting Pakistan’s security. Moreover, he said, a new anti-Pakistan narrative is being developed by the so-called intellectuals of Pakistan that was against Pakistan nationalism. By initiating this diploma, he said, a counter-narrative will be inculcated based on patriotism and nationalism. CSAS Director Prof. Dr. Umbreen Javaid thanked guests as well as other distinguished speakers and the audience for gracing the event. Introducing the diploma in Indian Studies, she said that it was the first of its kind in Pakistan. Earlier, the centre has launched the Journal of Indian Studies and the Centre is also going to initiate an Indian desk, she added.